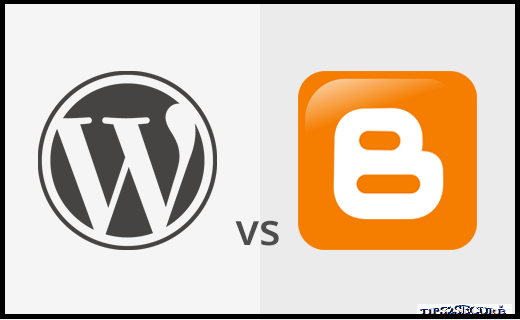 Blogger.com or WordPress, Which One is Best for Blogging? New bloggers and freshers are often confused in selecting the best platform as their blog hosting providers. They don't sure of selecting the right blog hosting service and end up with what to be select? If they select any of Blogger or Wordpress, still they don't feel satisfy and think that something is done wrong with their selection. I am personally asked this question many times by bloggers. So, in this post am going to highlight the major benefits and limitations of both Blogger.com as well as Wordpress. After reading this, anyone can set their mind easily to select the best blog hosting provider. Blogger was started by a tiny company in San Francisco called Pyra Labs in August of 1999. It was bought by Google in 2003. Blogger is a blog-publishing service that allows multi-user blogs with time-stamped entries. the blogs are hosted by Google at a subdomain of blogspot.com. Blogs can also be hosted in the registered custom domain of the blogger and blogspot.com domain publishings will be redirected to the custom domain. 1. A user can have up to 100 blogs per account. 2. Blogger allowed users to publish blogs on other hosts, via FTP. 3. Blogger allows its users to use their own domain free of charge. 4. It allows storage space up to 15GB to upload videos and Images in Blog.5. Blogger provides multiple country-specific URLs automatically for blogs hosted by different countries. For example if it is used by Indian then, it will be redirected as example.blogspot.co.in and if it owned by United Kingdom (UK) then it will be redirected as example.blogspot.co.uk. 6. Languages supported by Blogger is - Arabic, Bengali, Bulgarian, Catalan, Chinese (Simplified), Chinese (Traditional), Croatian, Czech, Danish, Dutch, English, Filipino, Finnish, French, German, Greek, Gujarati, Hebrew, Hindi, Hungarian, Indonesian, Italian, Japanese, Kannada, Korean, Latvian, Lithuanian, Malay, Malayalam, Marathi, Norwegian, Oriya, Persian, Polish, Portuguese (Brazil), Portuguese (Portugal), Romanian, Russian, Serbian, Slovak, Slovenian, Spanish, Swedish, Tamil, Telugu, Thai, Turkish, Ukrainian, Urdu Vietnamese. Nepali, Farashi.Bemba,Tonga, Tumbuka and cewa. 7. Blogger allows its users to choose from various templates and then customize. 8. Speed of blog hosted on Blogger.com is usually 40% more faster than others. 9. HTML template editor, so bloggers can use their own designed templates. 10. Blogs are Mobile friendly that are hosted by Blogger.com. 12. High security for blogs. 1. Storage for uploading media files (Images, Videos) is of 15 GB only. If you need more then you will have to buy space by paying money. 2. Number of blogs per account is 100. 3. Moving your site from Blogger to a different platform is a complicated task. There is a significant risk that you will loose your SEO (search engine rankings(, subscribers, and followers during the move. 4. Blogger allows you to export your content but your data will stay on Google’s servers for a very long time. 5. Support service is limited, mostly through forums only. WordPress started in 2003 by its founders, Matt Mullenweg and Mike Little with a single bit of code to enhance the typography of everyday writing and with fewer users than you can count on your fingers and toes. Since then it has grown to be the largest self-hosted blogging tool in the world, used on millions of sites and seen by tens of millions of people every day. Wordpress is based on PHP and MySQL. 1. WordPress was used by more than 23.3% of the top 10 million websites. 2. WordPress users may install and switch between themes. 3. WordPress's plugin architecture allows users to extend the features and functionality of a website or blog. 4. WordPress has over 40,501 plugins available which offer custom functions and features. 7. Free templates available to edit for blogs. 8. Support system is Good. 9. Using WordPress, you can move your site anywhere you want. You can move your WordPress site to a new host, change domain name, or even move your site to other content management systems. 10. Advance plugins for SEO. 2. Complex for newbie bloggers, even I also don't know how to use WordPress perfectly. Saying any of both as best will not fair, both have their significant importance. Selection depends on the need of blogger who is going to start blogging. After reading above given point and comparison, anybody can easily make their decision about which one is to use or which should avoid. Message: I hope that you have enjoyed 'Blogger.com or Wordpress, Which One is Best for Blogging?' article. However, if you want me to deliver more items then please share my post. You can use Social Sharing Widget provided at the end of every post. After all, Sharing is Caring! Self hosted Wordpress is also a good option. Blogger is best for on-the-go blogging.because its simply managed through an android phone also.but wordpress not.